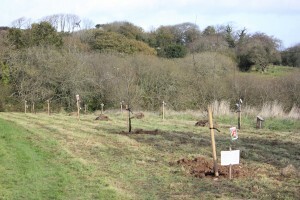 As part of our ongoing commitment to helping the environment, we have just spent a few days planting out the orchard. It is all the way across the top part of the wildflower meadow. This will hopefully helps the bees as they come into flower next season, and we should have some lovely fruit, apples, cherries and plums that our customers can try for themselves!